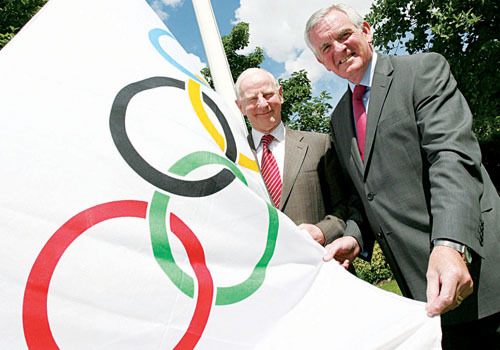 Pictured raising the Olympic flag at their headquarters in Dublin is Olympic Council of Ireland president Pat Hickey (left) with Volkswagen chief executive Bob O’Callaghan. The Volkswagen organisation in Ireland is to provide courtesy transport to members of the Irish team when they arrive in China to take part in the forthcoming Olympic Games. Through the Olympic Council of Ireland, a fleet of personnel carriers is being provided for the exclusive use of the Irish team to transport squad members, sports gear and equipment between their team headquarters, training camps and event centres. The arrangement was made possible through the Volkswagen organisation in Germany who are a leading vehicle manufacturer in China. Describing the arrangement as one which underpins Ireland’s Olympic participation, a Volkswagen spokesman said that they are especially proud to be one of a number of Irish organisations who have stepped forward to provide practical support for Irish team members and officials during their time in Beijing.